Atlantis has a software-defined, butch-bezelled, all-flash hyper-converged appliance radically cheaper than EVO:RAIL, Nutanix and SimpliVity alternatives, even the hybrid flash-disk ones. Its turnkey HyperScale product is a development of its ILIO VDI and USX VMware VM-accelerating products, which use RAM caching to speed data IO and so requires less powerful servers than other products. The RAM caching enables cheaper servers to be used in the HyperScale product as well, enabling the price differential. That's the logic we were given – but a look at some of the detailed comparisons shows that that's not always the case. HyperScale systems are 4-node appliances with a scale-out, all-flash storage design, orderable as a single item (SKU). Performance and capacity scale by adding nodes. There is an architectural reference list detailing approved components, such as servers which can come from Cisco, HP, Lenovo and Supermicro. There are 12TB and 24TB configurations, with a 48TB one in the works. SuperMicro TwinPro 2 server as used in Atlantis CX-12 and CX-24 SM. 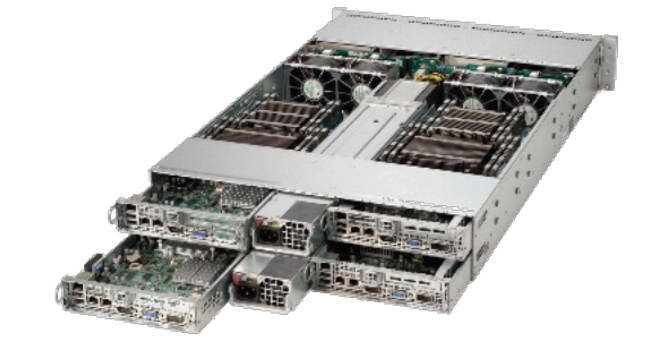 There are SuperMicro 2U TwinPro2 E5-2680v3 (96 cores) servers for the CX-12 SM and CX-24 SM. The CX-12 has 256-512GB of RAM, the CX-24 384 – 512GB. Both have two 10GbitE and two 1GbitE connectivity. The CX-12 has four 400GB SSDs, making 1.6TB raw capacity with it having a 12TB nominal or effective capacity after data reduction at a 70 per cent rate – your mileage may vary – and data protection to provide single node failure cover. The CX-24 gets four 800GB SSDs meaning 3.2TB raw capacity and 24TB nominal. It needs a hypervisor; VMware's ESXi or Citrix XenServer. That leaves out Red Hat's KVM and Microsoft's Hyper-V but it does defeat VMware lock-in, and they are coming in a second phase if the HyperScale product's development. There is policy-based storage management, via VVOLs with ESXi, a REST API, and the SW features deduplication and compression, IO reduction through caching and coalescing, thin cloning, tiering (DRAM-PCIe-SSD), and high-availability. The unified storage can export both NFS and iSCSI. When a customer gets the server, hypervisor software and Atlantis HCIA software on site a working box can be up and running in an hour, and it will "double the processing power and increase storage capacity by four times" over other HCIA systems. Atlantis says its data reduction is fast because it uses in-memory processing. Nutanix, it claims, has IO written to flash for deduplication which adds latency. SimpliVity uses an ASIC which adds cost and limits the server options. The EVO: RAIL gang don't have either dedupe or compression yet. Pricing plays a big part in Atlantis' strategy. HyperScale appliances will be between 50 and 90 per cent cheaper ($/GB) than EVO: RAIL, Nutanix and Simplivity HCIA products. Two charts compare HyperScale prices with those of Nutanix and SimpliVity at the CM-12 (TB) and CM-24 (TB) levels. Atlantis say the prices include includes three years 24x7x365 Premium Support with 4 hours parts replacement. From the charts it's plain to see how the server brand affects pricing, with Supermicro being the lowest cost and then HP, Lenovo and Cisco being progressively more expensive. Its comparable CX-24 has the same server and RAM, with 24TB (effective) flash capacity (Failures to tolerate (FTT)=1) and a price of $144,975, which is 65 per cent less for 50 per cent more capacity and a 77 per cent lower $/GB. Nutanix' all-flash NX-9040 has a 2U, 80-core SuperMicro server with 512GB RAM and 19.2TB of flash at a price of $800,397. Atlantis' CX-24 at $144.975 has 96 cores and is priced 82 per cent less for 25 per cent more capacity and 85 per cent lower $/GB. We've seen similar detailed comparisons between Atlantis and SimpliVity and EVO: RAIL; an enormous amount of attention has been paid to the pricing. The table comparing Atlantis' CX-12 against an EVO: RAIL configuration is startling - see for yourself and draw your own conclusion. 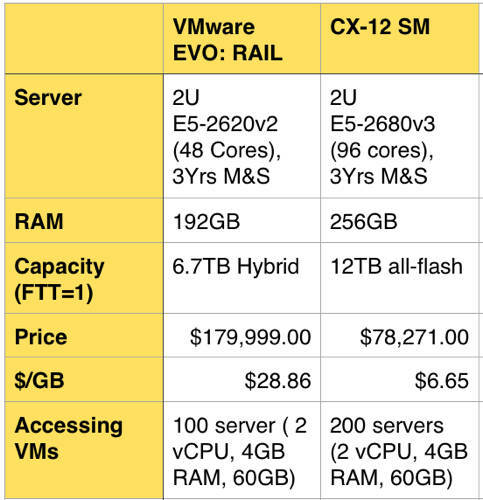 Atlantis HyperScale vs EVO: RAIL. Atlantis says its product has twice the processing power, 56 per cent lower pricing, almost twice the capacity (and that all-flash), 75 per cent lower $/GB and twice the VM density. If this is for real then it is startling indeed. Atlantis is a startup which has gained a total of about $35m through four funding rounds in 2007 ($2m), 2009 ($3m), 2010 ($10m), and 2013 ($20m); a solid funding pattern but not an excessive or high valuation one; this being no billion dollar valuation unicorn. Its enterprise customer count has passed 850 and it says it has some 50PB of storage managed by its deployed products. It also has a productive channel. It tells us that, since 2009, it has built the top market share amongst both hyper-converged and software-defined storage vendors in the desktop virtualisation (VDI) market, which it says is one of the top use cases for hyper-converged systems. That means three times more than Nutanix, 2.5 times more than VMware's VSAN/EVO:RAIL, and ten times more than Simplivity **. Venkatesh says he wants HyperScale to be a product for mid-size enterprises and smaller offices of large enterprises, but not small business. Atlantis' 850+ enterprise customers will be an obvious starting point for sales. HyperScale will be sold and delivered by Atlantis' channel partners, with end-to-end support, 24 x 7 x 365, provided by Atlantis itself, and 4 hour parts delivery from the server suppliers' networks. Can Atlantis pull this off? Can it spike Nutanix, Simplivity and EVO: RAIL's guns? If it really is offering equivalent performance, server quality and support for half the cost or even lower then it seems clear that the other suppliers will have to radically discount their prices and damage their business models. ** According to 2015 Project VRC Study - registration required.